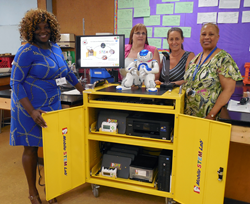 Dr. Subrina Oliver (left), Director of STEM for K-12, poses with Hempstead science teachers and their new Mobile STEM Lab. Investments like this are critical for evening the playing field for our students. As of school year 2016-2017, Hempstead UFSD will become the first Long Island, NY school district to integrate a K-12 STEM program. The Hempstead School District is a culturally diverse public school system serving approximately 7000 students. The labs are slated for use at the district’s sole middle school, Alverta B Gray Schultz Middle School, which serves 1392 students in grades 6-8. District Superintendent Ms. Susan Johnson, and Associate Superintendent for Secondary Curriculum and Instruction Mr. James Clark, worked tirelessly with the Community Engagement Team to procure funding for the labs through the Receivership Grant for Persistently Struggling Schools. The two new A+ STEM Labs will cost the District a fraction of the cost of constructing a dedicated, full scale science laboratory. “Investments like this are critical to evening the playing field for our students, who seek to graduate from our district prepared for college with a strong foundation in STEM education and ready to compete in the global market as confident and competent 21st century learners,” explained Mr. Clark. “For this very reason, as of school year 2016-2017, Hempstead UFSD will become the first Long Island, NY school district to integrate a K-12 STEM program,” added Dr. Subrina Oliver, Director of STEM for K-12. Teachers at the Middle School will receive initial, in-depth training on how to use the Lab’s technology, as well as ongoing support from A+ STEM Labs Professional Development team. Teachers will learn how to use the lab’s scientific probes and associated graphing software that comes pre-loaded on each of the student laptops, how to teach coding by programming the actions of the NAO robot and how to use a range of included classroom management technologies to maximize the efficient use of classroom time. This includes software to easily distribute, share and collect student files via Wi-Fi, control or limit student access to laptops when attention is required “up front”, and use hand-held “clickers” to allow students to respond to assessment questions in a fun and engaging way. “We realize that even the very best teaching technologies are only effective if teachers actually use them. A+ STEM Labs is committed to delivering solutions that are as easy as possible for teachers to master, so that the focus can be spent on teaching and engaging students in the important areas of STEM education that will prepare them for 21st century jobs,” explained Bill Waibel, President of A+ STEM Labs. There are currently over 500 STEM Labs in use in New York City Public Schools. To learn more about the company’s solutions, including video that shows labs in use, visit http://www.aplusstemlabs.com. Founded in 2002, A+ STEM Labs (previously A+ Mobile Solutions) was established with the vision of creating a portable technology and science cart that could be moved from room to room, at a fraction of the cost of renovating an entire classroom and dedicating it to science. Today, the company offers a range of turn-key solutions, customized to support grade-appropriate hands-on learning by students and to facilitate ease of classroom management by teachers. To date, over 500 mobile labs are integrated within the New York City Public School system. Sales, manufacturing and assembly are handled from the company’s headquarters in Bay Shore, New York. To learn more, visit http://www.aplusstemlabs.com.